Pattaya street vendors are looking forward to the return of European tourists during high season after a crackdown on “zero-baht” tours wiped out the Chinese low-season market. Massage services have not been affected by the clamp down. Vendors interviewed Nov. 10 expressed hopes for a good high season, saying the number of Chinese visitors fell after the government banned tours that let mainland tourists come to Thailand for little or no money down. 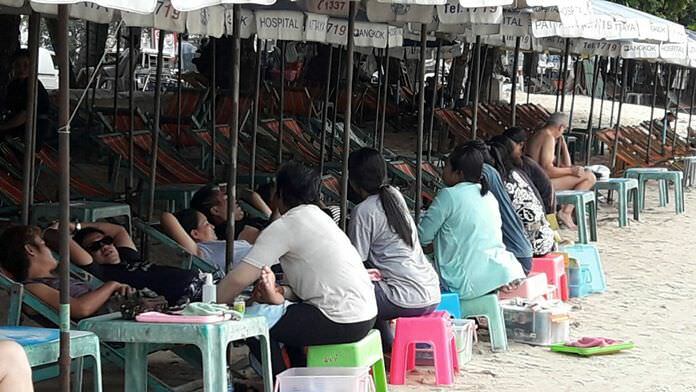 Beach chair vendor Sanan Pakdeewong said his business was pummeled after the crackdown, dropping nearly 60 percent. Currently he’s still down 20-40 percent, he said. Sanan said he’s taking in only about 700 baht a day and less in profit. He’s hoping for better times in the next few months. Boat operator Khularb Kwanmuang has seen his business drop as many Chinese used his boat to travel to Koh Larn. However, he noted, he’s been able to make up the shortfall with Japanese and Korean customers. Beach masseuse Wanna Fuengtate said she personally hasn’t been hurt by the crackdown, as most her customers are Thai or western. She’s not sad to see the cheap tourists go, however, as they contributed little to her income. 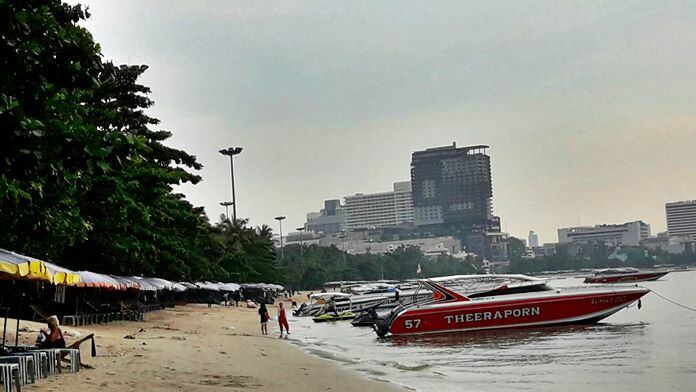 Pattaya is aiming at hosting 10 million tourists this year, up from 7.9 million. But those projections are falling far short, according to the Pattaya Business & Tourism Association.